A case study from Buryfields Infant School and Artswork. Buryfields collapsed their timetable for two weeks to run a STEAM project which combined science, art, drama, music and geography. They worked with visiting artists, STEM Ambassadors and scientists. Following on from our STEAM Briefing in partnership with Nesta last year we want to highlight some of the great STEAM practice around the country. Read on for more information about the Artswork STEAM networks and a Madagascar themed STEAM project. In 2016, Artswork, the South East Bridge Organisation, invested in eight Primary and Secondary school STEAM Networks across the region, with support from Arts Council England and the Department for Education. Networks were invited to bid for support to run programmes that would develop links between local STEM and arts organisations, provide further CPD opportunities for teachers, and embed Artsmark, Arts Award and the Quality Principles in the process. The programmes explored ways in which collaborative, creative approaches might connect the arts with a STEM curriculum and provide improved creative learning opportunities for pupils. The Networks launched in September 2016 with programme delivery following in the summer term of 2017. In Hampshire, Isle of Wight, Portsmouth and Southampton, the Networks chose the overarching theme of ‘Structures’ to work within. Each school used this as a springboard for ideas that suited both their interests and priorities. We decided to collapse our regular timetable and spend a fortnight on our STEAM project. We mixed the whole school up so children of a range of ages were able to work together and support each other. We had already begun our Artsmark journey and registered our Statement of Commitment, so it was a perfect programme to capture all of the school’s strong elements, and develop our work further. We embedded Arts Award at Discover level and invited STEAM experts to work with both the pupils and the staff through professional development sessions. Under the theme of ‘Structures’, we based our project on Madagascar, integrating our Geography, Multicultural Topic, and our STEAM programme of work. 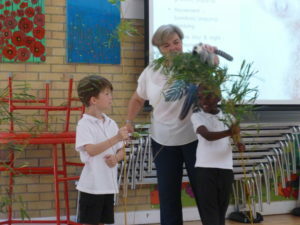 Our problem for the children to focus on was, ‘The lemurs want to return home to Madagascar – how can we help them?’ The programme began with a class assembly, which demonstrated where Madagascar was and what we hoped to learn. 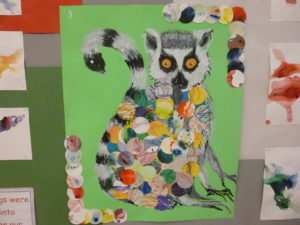 A lemur expert from Marwell Zoo explained the different species, their habitats, and how they function in Madagascar. Through Winchester Science Centre’s STEM Ambassadors Programme, we spent two days with Balfour Beatty learning how to make rubber band-powered cars and boats, for the lemurs to travel back to Madagascar in. We also spent half a day with Virgin Media’s STEM Ambassadors, developing communication methods for the lemurs in the jungle, using cups, string and mirrors. Our arts partners from across disciplines – Jim Bernadin (World Music Expert), Lisa Jean Gardner (Print Maker), and Lewis Mullins (Drama Facilitator) ran workshops to teach pupils about using watercolours, tie-dying, drumming, and creating physical picture postcards of Madagascar. The two-week programme closed with an exhibition at the school for parents and the local community to attend. Children who had worked towards their Arts Awards (by taking part in all the activities) led explanations of the tasks to other pupils and visiting adults. The process gave pupils an opportunity to show leadership, which they relished. There was also a slideshow with images captured from across the fortnight. Next steps for us include ensuring we continue to tap into all the arts partners and ambassadors for future STEAM activities. We have made such excellent connections and contacts and wish to build on them across the curriculum in future, rather than just condensing everything into a two-week experience. This was an ambitious and high-quality programme that created exciting and engaging learning opportunities for the pupils, whilst clearly embedding Arts Council England’s Quality Principles.